Why would a very smart New York investment banker pay twelve million dollars for the decaying, stuffed carcass of a shark? By what sorcery does Jackson Pollock's drip painting No.5 1948 sell for $140 million? And why does a leather jacket with silver chain attached, tossed in a corner and titled 'No One Ever Leaves', bring $690,000 at a 2007 Sotheby's auction? 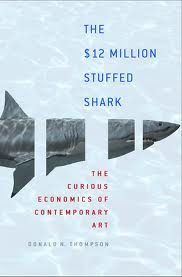 The Twelve Million Dollar Stuffed Shark is the first book to look at the economics of the modern art world and the marketing strategies which power the market to produce such astronomical prices. Don Thompson talks to auction houses, dealers, and collectors to find out the source of Charles Saatchi's Midas touch, and how far a gallery like White Cube has contributed to Damien Hirst becoming the highest-earning artist in the world. He unravels the sale procedures by which the top auction houses maintain both premium prices for what they sell and their own preminence, but also shows us a market whose most spectacular excesses are driven just as often by far simpler human urges like lust and self-aggrandizement. It is a world in which brand is all-important, and which in many ways has most in common with the branded world of luxury fashion. The result is a fascinating, shrewd and highly readable insight into a modern-day phenomenon.